All the world’s a stage is the quote that came to mind after watching Kit Monkman’s production of Macbeth. It is a film cleverly shot to bring the theatre experience to the big screen. Its use of green screen helped to create the feel that we are part of the unfolding drama, moving from scene to scene as though we were the omniscient eye part of the happenings but separate from them. The simplicity of the sets provide the space for the emotions and state of mind of the characters to feed the audience’s imagination and help create the reality the characters are acting within. It took a while at the beginning to almost reset my mind to recognising you are neither watching a film, as we are used to, nor watching a play but we have been positioned in an in-between place. This placement of the audience was purposely done by having the audience ‘viewing the action form a fixed perspective in ways analogous to being in a physical space and watching a live event’ say the team behind Macbeth. The penetrating stare of Mark Rowley’s Macbeth, the emotion that emanates from him and at times feels directed at the audience is both uncomfortable at times and absorbing. 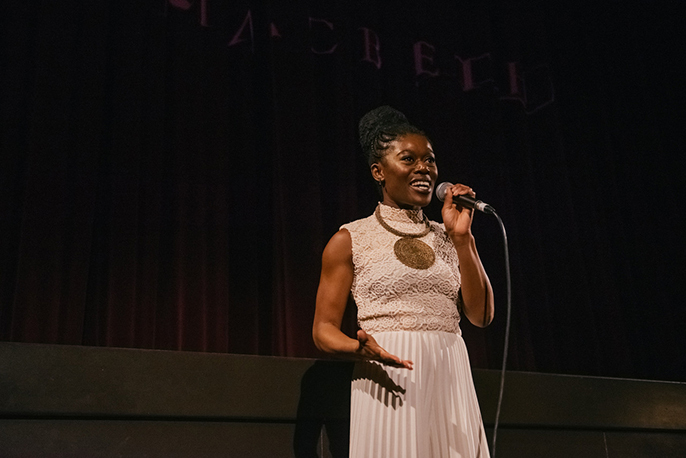 Akiya Henry was captivating as Lady Macbeth her gentle manipulations of all those around her particularly her husband are skilful and come almost as a surprise as she meets us as a sweet and loving character, likeable. To see her then become by turn cajoling and then bullying has the audience trying to reconcile their feelings as to how we are to feel about her, this now complex character. Henry’s Lady Macbeth is compelling and the perfect balance of managed melodrama and sincerity so her character remains believable, and to a point, relatable. Henry introduced the screening and in her opening she suggested different hashtags that could be utilised when sharing thoughts of the film one of which was #diversity. While I champion diversity and am welcoming the increased broad representation we are seeing on stage and film; I worry the focus on making spaces diverse may divert people from the truth behind the push for diversity which this film shows. This film is a cast of strong believable transporting characters and that is the goal – actors being cast because they are recognised as being the best at bringing this character in this production to life no matter the actors other defining characteristics – and this, to me, is the case with Macbeth. For a cinematic Shakespearean experience with a difference I recommend catching Macbeth this month. Info: Kit Monkman’s Macbeth is at a cinema near you on the 13 March 2018. Visit the official website for ticket and location info.